My family loves a good road trip! We love to drive on our vacations for many reasons. It is usually cheaper, but also, you get to do a lot of fun stuff during the journey to your destination along the way. 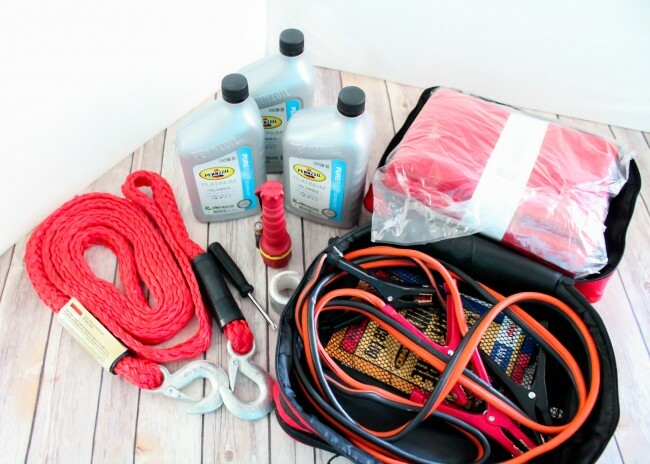 If you are heading on a road trip it is important to make sure your car is road trip ready. 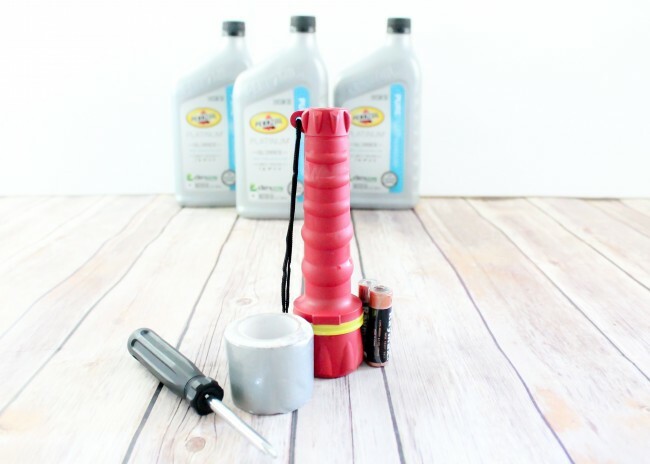 Today I am going to share with you what you need to check, and also show you how to make a Road Side Emergency Kit. 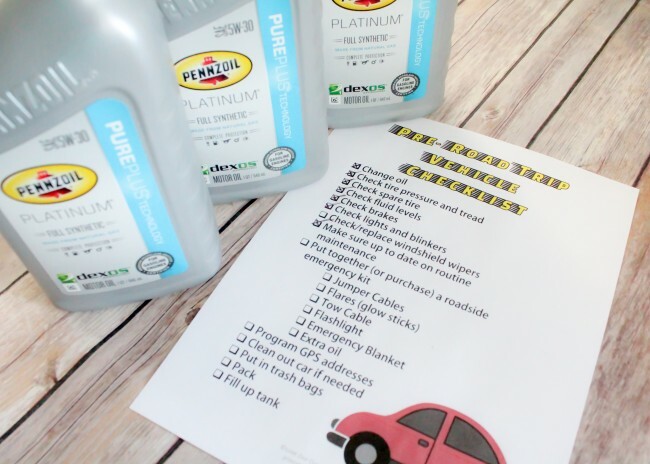 Plus I have a free printable pre-road trip vehicle checklist for you! There have been a few times when we have been traveling and things haven’t gone perfectly well. One time our car died while visiting family 5 hours away. Another time we learned a vehicle was burning through oil when we took it through the Cascades to get to Seattle. Thankfully, we were well prepared (over prepared is my middle name) with an road side emergency kit. There are several kits you can buy online, but many can be expensive, so I am going to share how to put together your own kit today. To start you will want to find something to put your emergency kit in. We have an old travel case that we that has two separate sides. The case is about 10 inches by 12 inches by 8 inches. It has several mesh pockets on the inside which is perfect for helping keep items organized. 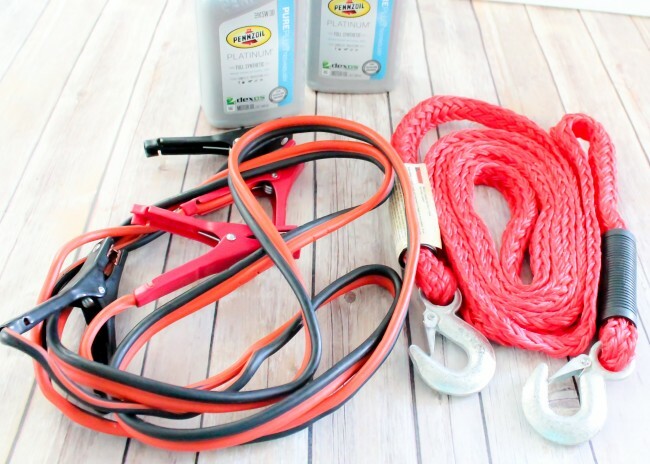 To start, you will want to get some of the basic vehicle emergency items- we have jumper cables and a tow cable. Now, jumper cables are no good if you don’t know how to use them. If you are someone who is not confident that you know how to use them, you can easily find instructions online. 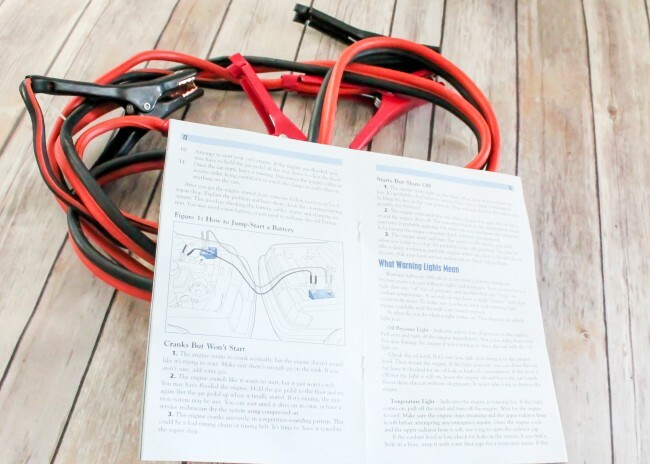 We actually have a road side emergency guide that was provided to us by our insurance that includes instructions on jumper cables, among many other scenarios. We also like to keep a few extra quarts of oil in the car. Remember my story about the Cascades? 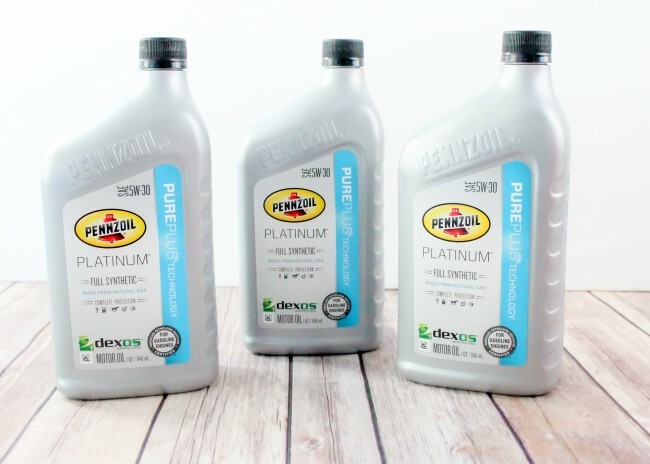 I chose to get some Pennzoil Platinum Motor Oil because it has PurePlus™ Technology that is proven to keep pistons up to 40% cleaner than the toughest industry standard. 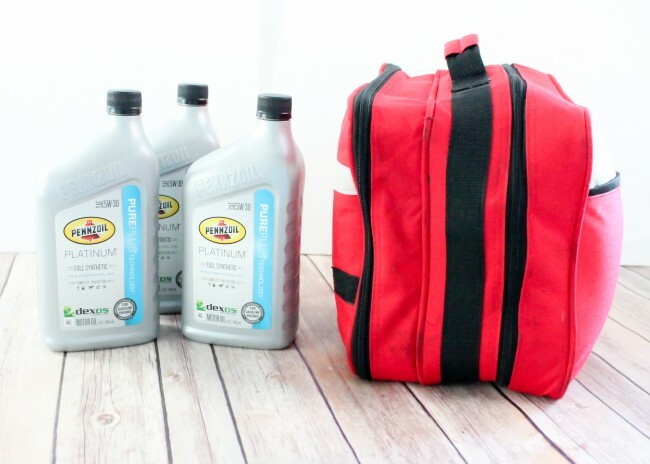 Pennzoil products can help clean out sludge left behind by lesser oils. Whether you choose the Platinum or the High Mileage line, Pennzoil is a great choice. Next, you will want to get a few extras that might help with any road side issues you might have. A flashlight with fresh batteries (store the batteries separately so they are at full charge when you need them), some duct tape and some screw drivers are a great start. Finally, we added a few extra in ours in case we ever came across an accident or were stuck on the side of the road, or other scenarios. For us, we included an emergency blanket and a first aid kit, as well as gloves and a few other items. We also put in some glow sticks to use as flares if needed. Now, I am busy, so I didn’t have time to run from store to store with 3 kids in tow to get the items I needed. I did however, have a few moments where I could look online at Walmart.com for the items I needed. So I started there. Ordering online is super easy and only takes a few moments. You can have items shipped directly to your home or your local store. In fact, many of the items in this kit you can pick up the same day. While picking up in the store does require a trip, it is easy to run inside and pick up the order and takes minimal time. 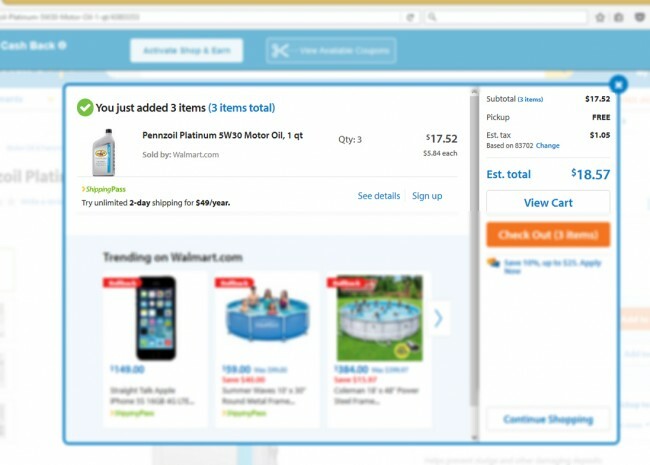 Also, Pennzoil products are on temporary roll back price right now at Walmart.com so be sure to go check them out. Now, having a road side emergency kit is not the only thing you need to do before heading on a road trip. 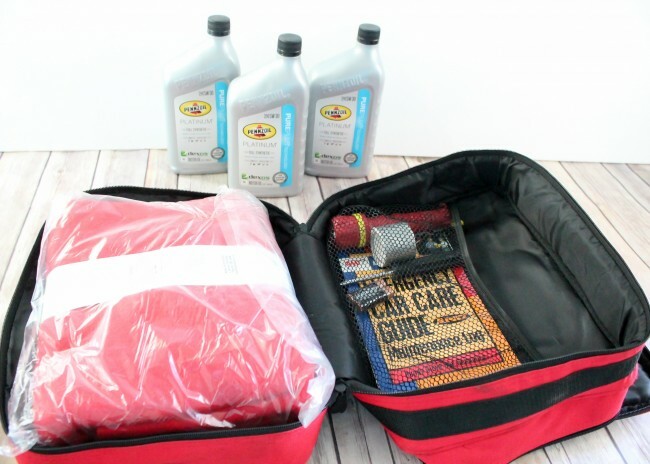 Be sure to make sure your car is road trip ready. 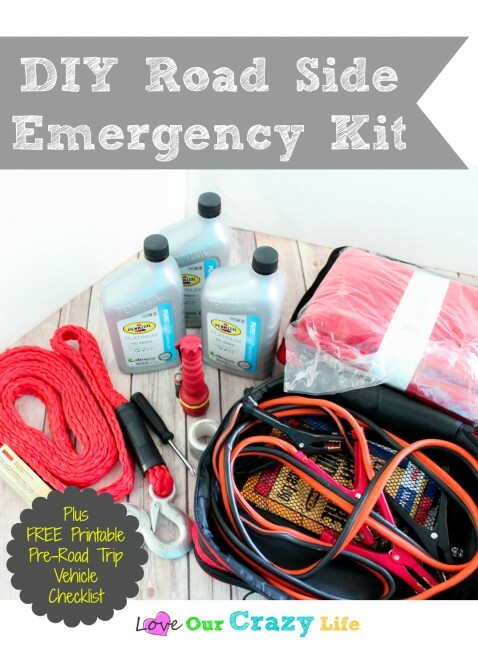 In order to help you do this, I have a FREE printable pre-road trip vehicle checklist for you. It will help make sure you do things like check your spare tire, remember to change your oil, and more. Printables are for personal use only! DO NOT duplicate or try to sell our printables. Not cool. Do not remove the copyright from the printable. If you do share our printable- YAY! That is great. However, please direct people to this post to obtain the printable. To print your checklist, click the link below, when the PDF pops up, click the download button, but then choose “Open with Adobe….”. Once you open it with Adobe on your computer, then you can print it. If you try and print it without this step it may not print correctly. You can get your free printable by CLICKING HERE. Are you heading out on a road trip this summer? Where are you heading to? Is there anything you put in your emergency kit that I may have missed? A pen and paper to leave a note case you have to leave your vehicle. Also emergency information. If traveling with pets remember their information also. Great add ons. I always have pen and paper in my glove box but I should have included it on the list. Thanks!